Also Known As – Artemisia absinthus, Absinthe, Absinthe Wormwood, and Old Woman’s Weed. 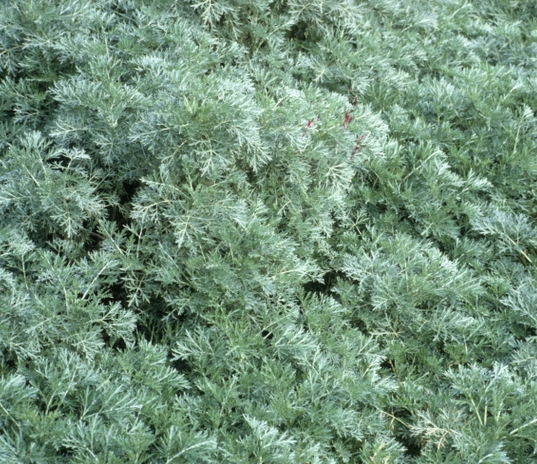 Overview - Wormwood is an attractive herbaceous perennial plant that grows between three and five feet tall. The tall spikes are covered with lacy, silver foliage that makes it a focal point in the garden. The tips are covered in small pale yellow flowers all summer long. All the plants in the worm wood family are extremely bitter tasting. The casual use of this herb is extremely dangerous. It should only be taken under the direction of a qualified health professional. Medicinal Uses – Internally, Wormwood is used to remove internal parasites. Wormwood has been used as a powerful tool to fight worms, most notably, eliminate pinworms and roundworms and other parasitic infestations in humans and animals. It has long been used as an anthelmintic that expels intestinal worms and research has indicated that because of the increasing resistance to parasites, the compounds contained in this herb are now relied on greatly to treat malaria. It has been used to induce labor and in more recent years to help epilepsy and muscle spasms. As herbal tea, the herb can be used to increase the appetite, treat diarrhea, nausea, stomach pain, vomiting and to help problems with the gall bladder. Externally, the oil can be applied to cuts, sprains, bruises and skin irritations. It also helps relieve itching. The oil is a mild anesthetic and can help with arthritis pain, lumbago, rheumatism, neuralgia and other problems. Other Uses – The herb is an ingredient in the drink absinthe and is also a flavoring for vermouth and other liquors. In fact, the name vermouth is from the German "wermuth" which means "wormwood". Historically, this herb would be strewn on the floor to repel fleas and other pests. It would also be laid with clothing to discourage moths. Parts Used – The leaves and flowers are harvested when in full bloom and dried. Precautions - Pregnant and nursing women should not consume this herb because it can cause miscarriage. Taking internally may irritate the gastrointestinal tract, so if you have ulcers it would be wise to avoid. The oil can be dangerous and produce psychoactive effects in doses larger than 5 drops. Wormwood oil should also not be applied externally over organs like the heart, liver, and kidneys. Suggested - For oral administration, it can be taken as capsules, tincture, extract or powder. It may be mixed with other bitter or aromatic herbs. The packaging is great! I'm so happy I found this shop! yummy! shipping as described. larger quantities than I expected! Herbs smell so wonderful and I can't wait to use them! Everything I received was well packaged and delivered in a timely manner. Shop owner was very accommodating and flexible with shipping. Quick to respond and very nice! Herbs smell so wonderful and I can't wait to use them! Very fresh and clean herbs nicely packed. Thanks! Click the button below to add the Wormwood Herb to your wish list.